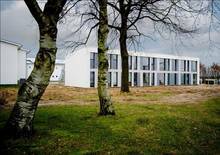 The municipality of Birk in Herning is located in the Jutland region of Denmark, 170 kilometers from the German border and approximately 3.5 hours drive from Denmark's capitol city of Copenhagen. The municipality has a strong commitment to sustainable technologies. A prime example is on view in its H2College project, which is a building that provides housing 66 units of youth housing that are CO2 neutral, completely powered by renewable energy, and built for less money than conventional construction. 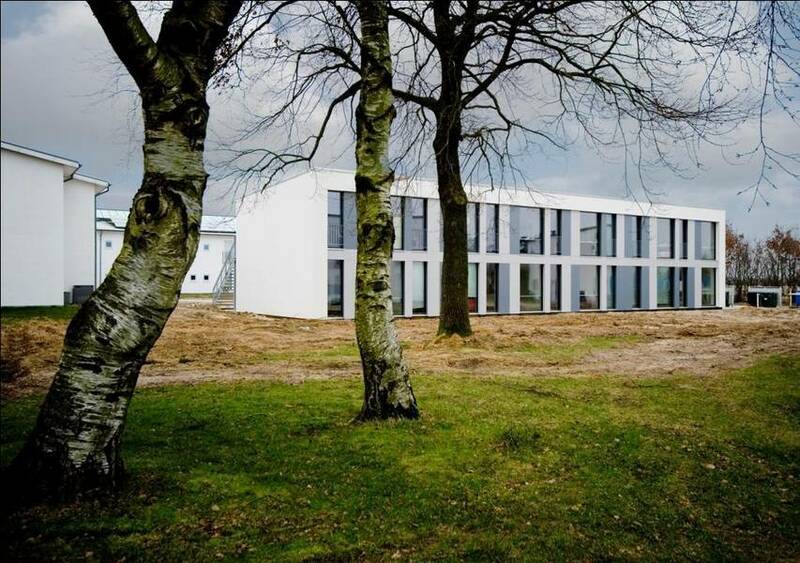 H2College was highly collaborative, interdisciplinary project led by the Herning housing association Fruehøjgaard and designed by architect Aarhus-architects, with Niras consulting as engineers. 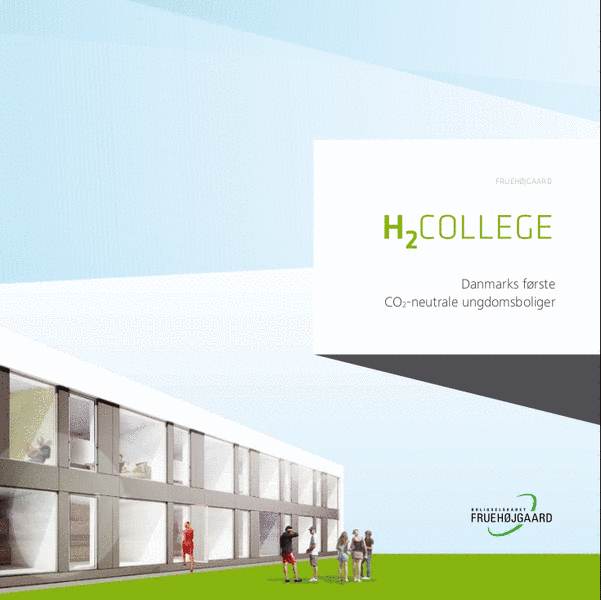 The Hydrogen Information Center (HIRC) also partnered on the project, and financing was aided by grants from Ringkøbing County, Herning Municipality, Danfoss, Fruehøjgaard and energy supply company Energi-Midt. Private funding is reported to have been € 8.250.000 and public funding € 550.000. The Housing Ministry was first approached about the project in 2006, and the doors finally opened to residents in 2009. H2College's energy system begins with energy savings. Passive solar design, insulation, high efficiency windows, and heat recovery bring energy consumption down to 120 kWh/m2/year, which is 98 percent below that of the average household in the area. 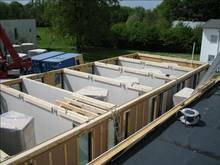 The pre-fabricated building envelope added to the overall energy efficiency of the project. Electricity and heating are supplied by off-site wind power and onsite photovoltaics, and onsite electrolysers and micro combined heat and power plants (MCHPs) that use excess wind to produce hydrogen at night when electricity is inexpensive. Herning has long supported development of hydrogen technology for heating and transportation and considers H2College to an important test site for this evolving renewable energy option. A geothermal system produces hot water. Because the building did not need standard heating installations, radiators, etc., and because it made use of less expensive German elements, the price tag for construction came in at 8% less than typical construction in the area. Operating costs are also lower than average, due to the heating system relying on free renewable resources and heat recovered from ventilation.Operational expenses for H2College were subsidized for the first year, after which it had to be financially self sufficient. Although H2College is deemed overall to be a success, there are also challenges and lessons to be learned from this pilot venture. For example, when the project began, passive solar design was brand new to the area, with only one existing sample. For help, the team had to turn to Germany, which had the most experience in passive solar construction and which was able to deliver service for 40% less money than Danish counterparts. Additionally, electricity costs are higher for the building, although subsidies prevent H2College students from paying extra utility bills. One reason is the 30% loss which occurs from the input of electricity, conversion to hydrogen and conversion back to electricity. This raises electricity rates at H2College by about 20% compared to conventional electricity, a difference covered by Energi-Midt. Additionally, wind electricity, which cannot be produced onsite according to local regulations, is purchased at a slight premium over conventional power. Solar photovoltaics also require subsidies to be viable. Implementing legislation that allows renewable power to be sold back to the grid at a reasonable profit, as Denmark used to do and which countries like Germany have successfully achieved with their feed-in tariff laws, would likely bring down the cost of renewable power considerably. Another lesson learned was that the certification process for passive solar design turned into a greater focus than actually achieving quality. As a result, the heating system is not as functional as it could and should be. Streamlined certification processes, along with earlier monitoring and quality control could prevent this. 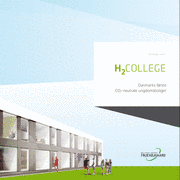 H2College has received numerous awards and has gained recognition beyond the municipality of Herning, notably having been nominated for the EU’s Sustainable Energy Europe award.